In 2006 Gerard Roe published a paper “In defense of Milankovitz”  which showed a good qualitative agreement between the rate of change in ice volume with Arctic summer melting as measured by maximum insolation at 65N. The ice volume (temperature proxy) as measured by the Benthic DO16 stack is not correlated directly with insolation but instead interglacials are better correlated with the eccentricity cycle. I have re-anlaysed data from a previous analysis to look for a correlation with the differential of Bentic DO16 data . I use an orbital calculation of maximum insolation at the North pole to look for correlations. The result if shown in Figure 1. There is a clear tendency that with Milankowitz increases in summer insolation at the North pole induces decreases in Ice volume. However it can’t explain why 100,000 year interglacial periods have prevailed for the last 600,000 years. Ruddimen  argues that CO2 changes induced by Ocean temperatures should be seen as a feedback on Ice Volume rather than a cause direct cause. The 41,000 year changes in tilt effect the latitude range insolation. Interglacials seem to occur at multiples 41,000 years. For 2 million years until 900,000 years ago interglacials were in phase with obliquity. Then as the climate continued to cool they switched first to 2 obliquity cycles and then to 3 cycles from 600,000 years ago. Ruddimen argues that the current saw tooth oscillations are caused by non-linear CO2 feedbacks. – see Figure 2. CO2 is therefore not a cause of glaciations, but instead acts as a feedback on the primary cause which is Milankowitz orbital variations in insolation. Summer insolation reduces Ice volume and ocean temperatures rise. This increases CO2 levels in the atmosphere. Any enhanced greenhouse effect is a logarithmic response to solar forcing depending on temperature. 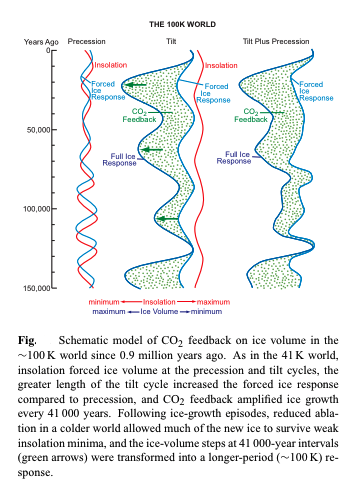 It seems to need 3 tilt cycles before the induced CO2 response is large enough to trigger an interglacial. This entry was posted in Climate Change, climate science, Ice Ages, Science. Bookmark the permalink. “The ice volume (temperature proxy)… “. Wouldn’t ice volume be a proxy for “energy in the climate system”, which in turn would be the integral of the surface air temperature? It seems to me that ice will melt fastest when temperatures are highest. CO2 would be also be an energy proxy. If this is true, then CO2 would lag temperatures by a much longer period. Perhaps I’m off base? That is, due to coupling, temperature and energy might be nearly perfectly correlated. At this point, however, I doubt it. By CO2 being an energy proxy do you mean that it follows sea surface temperature ? Ice melting clearly depends on air temperature which rises as the 4th power of insolation. The highest insolation at the north pole occurs fo largest obliquity and when summer coincides with the orbital perihelion. Then again, maybe the 65N and tropical temperatures are out of phase. Maybe ice volume is a good proxy for tropical temperatures and thus global temperatures. It’d be nice if someone somewhere could explain the ice volume = temperature relationship. I must be missing something. It seems I’m the only one interested in this question. I think the relationship between Ice volume and temperature must be non-linear. Something strange happens to trigger an interglacial. Currently inter-glacials are triggered every 3 cycles of obliquity. 3 million to 1 million years ago they were triggered every cycle of obliquity (41K years). Currently the earth has cooled to a stage where saw-tooth oscillations occur roughly every 100,000 years. This means that the ice melts fast once an instability occurs. This could be due to an enhancement above Milankovitz forcing due to albedo/ clouds or something else. I have just discovered your blog – nice to see something on climate by a fellow physicist. I am working this up into a full stochastic model of ice-age climate. I was researching radiation transfer vs lapse rate when I came across your blog.